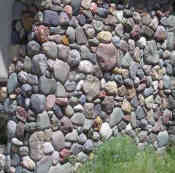 River Rock are real stone with smooth surfaces created by tumbling around in rivers for many years. This page is about the natural rock. For man made river rock, see the stone, manufactured page. 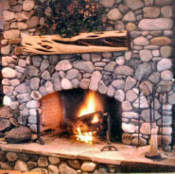 River Rock is used for veneer, structural, and flooring applications. Usually a very dense stone, but it will stain. Some may show crystal deposits. A wide array of colors available. Colors can be deep and rich depending on sealer. Many choices for finishing gloss - from none to high gloss depending on the sealer and number of applications. #2. If the River Rock is grouted, but never sealed. #3. If the River Rock has had a sealer applied in the past. Showing "S-B-S Sealer" on River Rock . 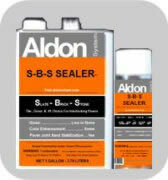 This sealer is | Solvent Base | Penetrating Type. Provides: color enhancement | low gloss | strengthening | efflorescence barrier. Coverage guidelines (depending on absorption) 150 to 500 sq.ft./gal. One application of "S-B-S Sealer" on this River Rock. Definite Color Enhancement - Matte Gloss with 1 spray application. S-B-S Sealer is available in aerosols spray cans for small projects. We consider our other type sealers to be too high in solids level for the typical absorption rate of River Rock. Typically this is the best sealer choice for River Rock, but you can test any of the others also. Easy Care Products: for a any floor. "Maintain" - for no streak wet mopping of River Rock and all other types of flooring. You may have heard of concerns about River Rock . All of them would be prevented with the information we provide here. Therefore, you can have the floor you want!